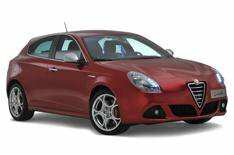 Alfa Romeo Giulietta Multiair driven | What Car? Perhaps you can have everything after all. Alfas turbocharged 1.4 litre petrol engine powering this Giulietta delivers strong power and torque yet still manages to meet frugal Euro V emissions standards. Theres 168bhp and 184lb ft to play with, meaning a 7.8sec 0-62mph dash and enough performance to put a smile on your face. Impressively, thanks to the clever Multiair technology, that combines with a CO2 output of just 134gm/km and official fuel consumption of 48mpg. We managed closer to 43mpg during test runs, four-up, loaded with baggage, but thats still an impressive real-world figure for a car with this much performance. That tech also means the engine has bags of low-down pulling power. You can comfortably use sixth gear at 30mph, boosting economy and refinement, because theres no engine noise in the cabin to speak of. Rev harder, though, and an appealing growl is there to enjoy. The Giulietta is also well balanced, and only a little body roll and poor steering feel impinge on the entertainment if you choose to enjoy a rural road. It copes well with the UKs ridged roads, and while it deals with broken surfaces with slightly less composure, thats all part of the trade-off of choosing a sporty model. Rear visibility is poor, theres a little wind noise from the door mirrors, the drivers footwell is cramped and rear space is tight. These are niggles rather than deal-breakers, though. Overall, though, your heart would only have to overrule your head by a fraction to choose one of these over a VW Golf. No question, its the best Alfa money can buy and very close to the best in class.